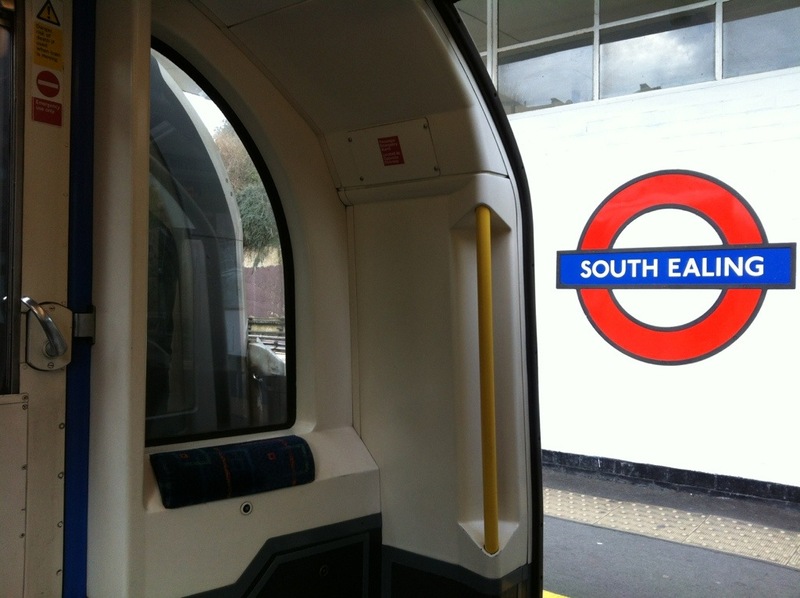 I blog to you this morning live from the Piccadilly Line, London. It is not a smooth experience. Clearly the train driver is experiencing a certain reluctance at his compulsion to work on the Saturday before Easter. Either he is grouchy, or impatient, or he wants to bring a little extra excitement to his life and ours. Whatever his motivation, we have covered the distance between Hounslow and Osterley with the swiftness, if not the comfort, of the winged messenger himself. And every now and then the train stops and the electronic budgies twitter and a grave lady reminds everyone to Mind The Gap. There must be five languages rattling on in my part of the carriage alone, a festive Saturday morning Babel hurtling towards Boston Manor at a rate of knots. There is a uniform, though. Everyone wears jeans, those indigo talismans against the unseasonable temperatures. We rattle past allotment gardens and the little housetops, colleges and car parks, satellites and suburbia. I have 12 stations to pass before I change for Westminster and the Banqueting House; and the enforced sit-down is rather novel. Already, the train is at standing room only and filled with murmurs of happy anticipation. Everyman has his day’s itinerary, and each of ours is different. Here we sit, very British, together yet apart, thrown from side to side at the whim of our gung-ho guide through the underworld. Posted in LondonBookmark the permalink. Blogging on the go. I did send a blog post from the plane last week. But we were still parked at the gate :-). Still jolly impressive, Steven! I’ve really enjoyed your travel posts! Train travel is the best way to people watch…. and listen. Great fun. I haven’t experienced that for so long. I can’t say that I miss it, but it certainly stimulates a sense of nostalgia. Great picture. Thanks 🙂 Lovely route: straight from Heathrow into the heart of London. I walked out of the British Museum and got strraight onto a train which took me, without any changes, straight back to my car. does the train have a wireless connection? No 🙂 But it does spend a lot of time overground for an underground train. That is a treat, more sunlight than artificial? Made me think of my son there in London today, making his way to and from Emirates Stadium by train. Thank you, Nancy. I’m back home now after a whistlestop tour of some favourite places. It snowed. Brrr. I’m fascinated by Tube behaviour…. how people just do *not* talk or look at each other. One can irritated one’s fellow passenger quite easily by idly reading his newspaper. The rule of thumb seems to be to shut out other people by concentrating very hard on a phone, a tablet, a book, a newspaper or to shut one’s eyes and pretend no-one else is there. Why is this? Is it fear or lack of interest in your fellow man? I just can’t imagine people behaving like that in Wales. They’d be nattering nineteen to the dozen. Four minutes of darkness in one of those tunnels is not for the faint hearted, Jan! I think there is quite a marge proportion of people on a tube train who are mad-as-a-box-of-frogs. I bet if someone did a statistical exercise there would be more MAABOFs per 100 of the population in a London tube carriage than anywhere else. Course everyone gets on and off so quickly it would be hard to carry out such an exercise. Loved the ease of riding the tube while in London some years ago and surprisingly less crowded than Toronto’s version. My favourite would be buses,but I don’t find them as simple to fathom as the tube, Joss. Happiest of Easters to you Kate – wherever you may be to celebrate it. 😀 Or bordering on the obsessive, one or the other…. Sadly it is not as good all over the country, Tandy, as I’m sure you will know. Did you try the Clockwork Orange during your stay in Scotland? Indeed. Perhaps we should all slow down a bit, Ruth! Kate, this is a perfect description of some of the rides I’ve experienced by bus and cab … “…thrown from side to side at the whim of our gung-ho guide through the underworld.” Gave me a chuckle. 😀 There are plenty of drivers like that out there, aren’t there, Judy? I thought they’d stopped the ‘Mahnd the gap!’ thing. Has it started again? I found Tchoob travel great fun. My Express Worm in Baa was based on it. Even to the stations, like the one where two kings got annoyed with one another, and another where you can hear the permanent circus music as you pass a river crossing for oxen. As far as I know, Mind The Gap never stopped, Col. It’s been there every time I set foot in London. Your express worm sounds fab. Ah, yes, I was getting confused. They changed the recording and the new one seemed to lack the same character. Travelling in from Heathrow is always a challenge, even for plane-spotters. It’s a very long ride out there with so many stations on the way. It’s not a lot better by car either – if that helps! To me the route was a revelation, Martin, because I have traditionally taken the Reading-Waterloo line. And I feel sure you will know what that means. I can park at Hatton Cross and be at the British Museum within the hour, and for me that’s revolutionary! Wow, I would never blog from the New York City subway even if I had a smart phone. It’s a very aggressive environment and I. Just. Wouldn’t. Risk. It. Life is so much more civil on your side of the pond Kate. Apparently, Lame! It had never occured to me that blogging might be a no-go activity for some trains. However I’ll bear that in mind if I’m in New York. Trains are often very crowded and fellow passengers very cranky out here, Kate. Since I’m a fan of self-preservation, I try to avoid doing anything that might draw attention to myself. Yes, thank you. I had an absolute blast, as usual, Debra. So much to pack into the brain in one day.